Smokey Mountain granite is quarried in a boulder quarry in Brazil. 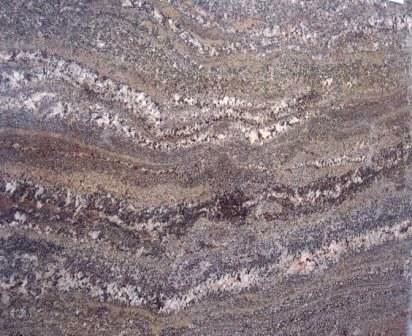 It is a beautiful, rich granite with lots of movement/ veining. Smokey Mountain is overall a dark brown color. It also has cream, black and sometimes red. The slabs change drastically in color and pattern from bundle to bundle, so be sure to select your exact slabs! Smokey Mountain was one of our most popular granite colors about 6 years ago. While it's not nearly as popular anymore, it is still one of my favorite granite colors. When the slabs look like the photo above I just LOVE it! Check out this custom made granite sink in the photo below. Beautiful! There are some difficulties in the quarrying process of this stone, so it is a limited production color. This also ups the price of this stone. Smokey Mountain slabs are bookmatched. Other names for Smokey Mountain include Juparana Rustico, Sucuro, Sucuro Brown, Sucuri and Sucuri Brown. Smokey Mountain is available in 2 cm and 3 cm slabs.